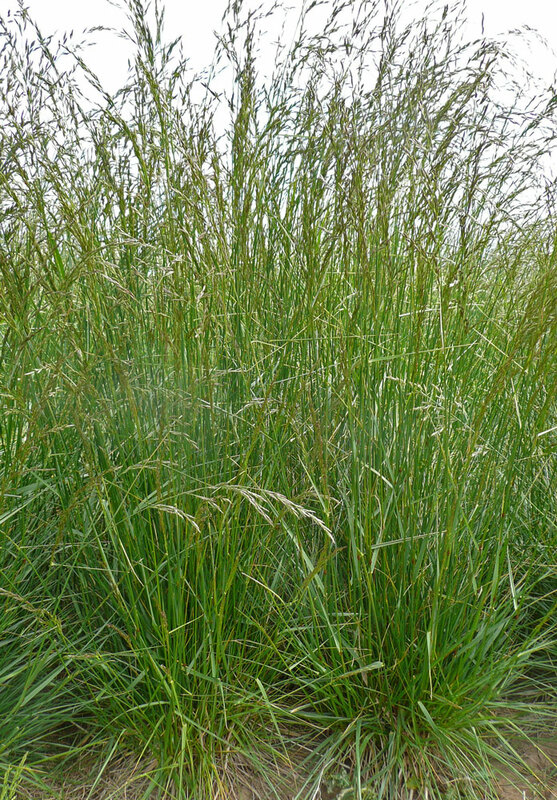 Meadow fescue is a tall loosely tufted perennial grass with wide flat leaves. Its flowering stems grow up to 120cm terminating in branched heads which usually nod to one side. 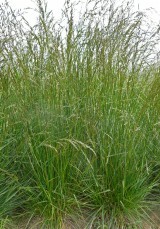 It will form tussocks if given space, but is not as robust or tall as the very similar Tall fescue. NB Until recently this flat leaved fescue had the name Festuca pratensis when it was classified with other finer fescues which have narrow rolled leaves. Meadow fescue is widespread and common in wide range of neutral grasslands, including grazed pastures, hay- and water-meadows and verges. It is most frequent on lowland moist fertile loamy or heavy soils. Meadow fescue is not a particularly long lived grass and relies on seed to spread or regenerate. It survives best in meadows which are cut for hay in summer; especially where seed has a chance to ripen and regenerate in open gaps left after removal of the hay crop. It persists less well in continuously grazed pasture or neglected rank grassland. Meadow fescue seed can be sown at any time of the year when soil conditions are suitable. Meadow fescue is a moderately competitive plant. It is not as vigorous or responsive to nutrients as ryegrass, nor as quick to establish from sown seed. In old unimproved grassland it is rarely a dominant grass. However, on good soils its rather tall stature means that not suitable as a component of finer grassland and wild flower meadow seed mixtures. Meadow fescue has been widely sown as a fodder grass for livestock as it produces highly palatable grazing and hay. Its ability to produce growth in winter and early spring is also valued by graziers. It typically forms a minor component of a managed mixed sward forming only loose tufts or tussocks which are easily dealt with by mower or scythe.